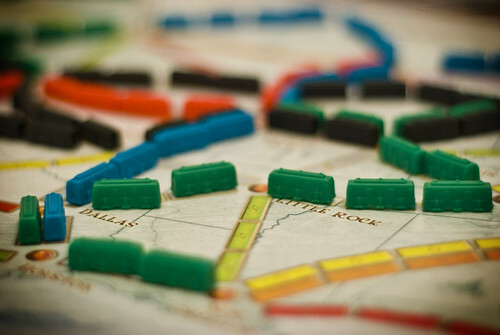 Ticket To Ride (19/365 year 3) – Annoyingly Boring? My boys received this board game as a Christmas gift in 2008. I am sad to say that today was the first time we broke it open. A fun game for sure! Obvious enough for all to enjoy, but with subtle strategy to make paying attention to detail worth it. To be sure, it won’t collect dust for over a year again. The Management was over at “my place” early this afternoon and commented that I had the exact same title as you posted to this entry. On Rupe’s honor, I had no inkling you had this posting posted and titled thusly. Grapevines think alike. They do, indeed …..
this is an awesome game. I haven’t bought it yet, hmmm might be a good birthday gift for hubby coming up, but we played it with some friends last summer when visiting them.